Grammy-winning gospel singer and longtime associate of Billy Graham, George Beverly Shea became perhaps the most widely heard gospel artist in history, appearing before an estimated 200 million people at graham revival meetings worldwide. Incredibly, Shea was still singing as he embarked on his second century. He often blamed Billy Graham for his longevity as a singer, saying the evangelist would not let him retire since he argued that retirement from the work of God is not a scriptural concept! to this day. He also sang at the prayer breakfasts of a series of American presidents, including Dwight D Eisenhower, ?Lyndon B ?Johnson and the first George Bush. In contrast to his boss, Shea’s vocal style was characterised by his resonant and melodious bass-baritone, sometimes ending a song on a deep bass note that would make his audience’s hair stand on end. When singing about his lord he delivered the words with impeccable diction and sensitive musical phrasing. Although there was nothing overtly showman-like about his delivery, his singing nevertheless conveyed his own ardent christian faith. 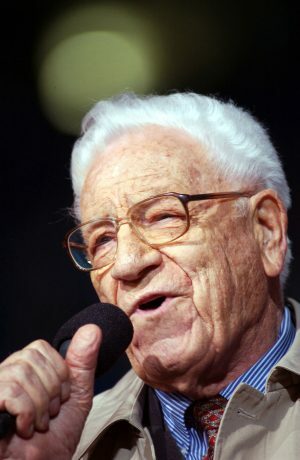 Known to his friends simply as ‘Bev’, George Beverly Shea, entered the world on February 1, 1909, in Winchester, Ontario, one of eight children born to a devoutly Christian couple. His father was a Wesleyan methodist minister and his mother the organist in her husband’s church. Like every red-blooded Canadian boy, Bev dreamed of becoming a ‘mountie’ when he grew up, but music also played an increasingly large part in his life. He studied piano, organ and violin but said he learned singing around the family table! the world at large first heard Bev’?s celebrated voice when he sang in his father’s church choir. As a young man Shea went to study at Houghton college, new york, but his education there was interrupted by the great depression, which necessitated him abandoning his studies to help support the family. He found work for the next ten years in manhattan as an insurance clerk, while continuing sing- ing lessons with private teachers. It was during this period that bev entered an amateur talent contest on fred Allen’s radio show. He sang ‘go ?own, ?oses? but was pipped for first place by, of all things, a yodeller! In spite of this the exposure led to offers to sing on commercial radio. In 1933 a network radio director heard Shea sing and arranged an audition to sing popular secular songs for your Hit parade, a national program with the Lyn Murray Singers broadcast on the NBC network. Shea passed the audition and was offered a job, but reluctantly turned the position down because he didn’t feel right about performing secular music.